Wales is becoming an increasingly popular destination for travelling golfers. You can choose to play any of the major golf courses within 4 distinctly separate areas of Wales and we will arrange your choice of standard or luxury accommodations plus self drive vehicle rental, chauffeured transport or just plain transfers between airport, hotel and courses. The best known courses in Wales are undoubtedly Royal Porthcawl, Royal St David’s and the Ryder Cup venue of Celtic Manor. Royal Porthcawl and Celtic Manor are both in South Wales, whereas Royal St David’s is in the north west. Each area of Wales has its own distinct attractions. North & West Wales – This area contains excellent Links courses and a spectacular coastline. There are splendid sightseeing opportunities which could include a trip to the island of Anglesey. 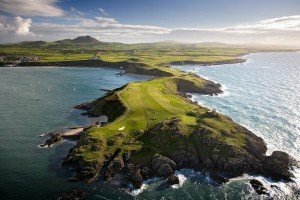 Come and play golf in Wales, with some of the best courses in the UK and let Golf Vacations UK organise your trip of a lifetime.